Window trims for the interior are easy to install and come in a traditional textures and colours. For the exterior however window trims and window moulding require some more planning but the options are far greater. There are wooden, vinyl, stucco and even stone trims that you can choose. These exterior window trim options work well with stucco walls and can be combined with stone veneer. When it comes to decorating vinyl windows the possibilities are truly endless. 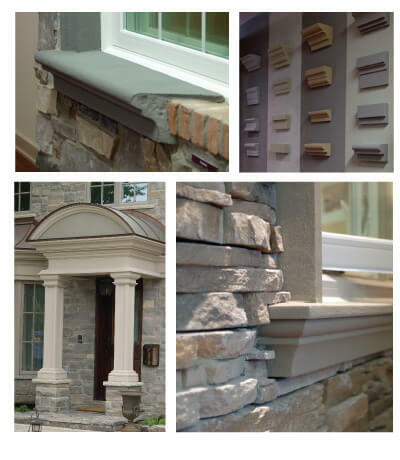 Here are some exterior window trim and moulding ideas. 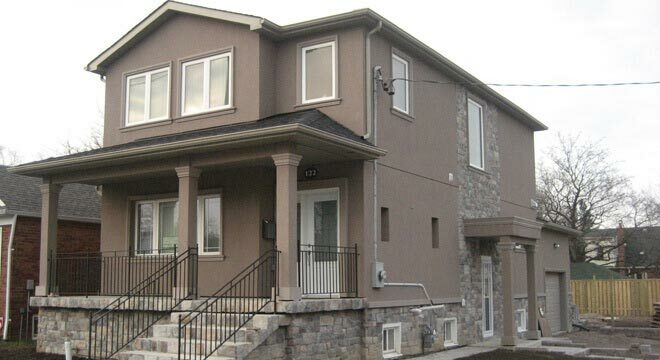 The beauty of combining stucco with stucco mouldings is the colour options. Stucco can be painted any colour with specially formulated pigments. 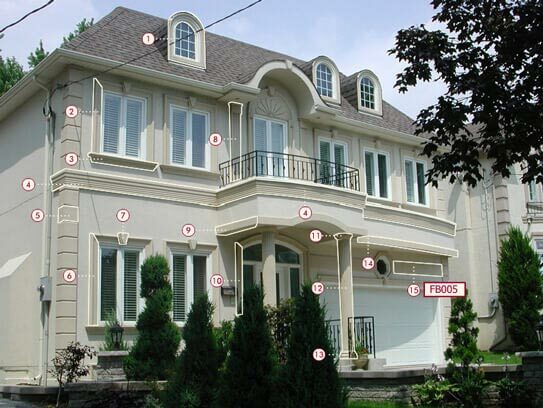 Matching up your home’s stucco wall with the stucco moulding will create a strong unifying effect. Alternately you can choose to paint the mouldings a lighter colour than the walls to create a subtle contrast. Both solutions are popular choices but with the option to paint the material any colour you desire the moulding ideas become plentiful. For those who are really adventurous about their exterior window trim styles there’s an option of combining stucco with siding and stone veneer. 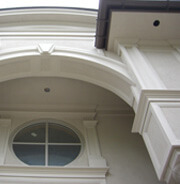 Stucco moulding can be installed around a window and accented with stone veneer trim pieces. Choosing the rights colours of your window moulding can be planned in advance with paint chips, just as if you were painting a room. Stucco moulding comes in a variety of colours that can be used in combination with stone veneerpatterns. Pay attention to the tint of the stone veneer, every pattern will contain a few different colours that are combined to create the natural stone look. Combine one of these tints with the stucco paint chip of your choice. Use hues from the same colour palette to create an earthy feel for your window, or experiment with contemporary and modern window moulding styles. Any result can be achieved with a unique design and the right kind of planning. A great theme that incorporates the exterior moulding/stone veneer combination is the Victorian mansion. This style works well for homes that have multiple stories and pointed roofs. The main idea is to emulate the look and feel of Victorian castles. The best way to do this is to first choose a suitable stone veneer. Large stone patterns like Cathedral and Castle stone work best at creating an authentic castle look. Choose a hue that works with pre-existing stucco or decide on a stone veneer colour with the moulding and stucco colours in mind. It’s very important to match up the two hues. Once you’ve decided on a stone pattern and colour it’s time to choose an appropriate sill to install around the windows. The style really depends on your own personal taste. Rounded sills and trims have a more modern look to them whereas the rectangular style creates a more rustic castle feel. The trims will add a new dimension to the windows and add the Victorian feel. 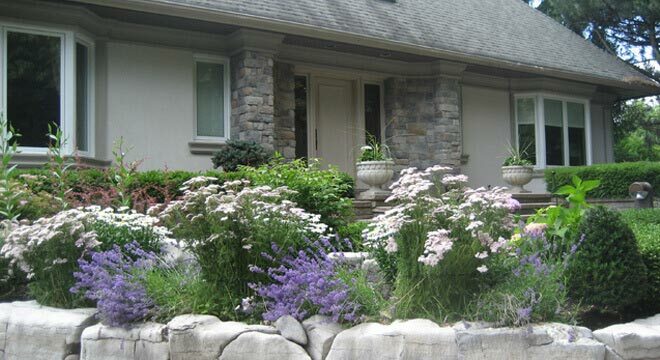 In this scenario the stone veneer can be used to cover an entire area of the exterior. Covering one protruding facade or balcony in stone veneer is the most common option with this technique. If you can’t find the right sill/trim or you want to use stone veneer exclusively then you can omit the trim/sill mouldings and use special stone veneer trims to seal the window edges. Ask one of our sales representatives for further details. We pride ourselves on thorough consultation expertise and installation work on all types of projects. Infinity Windows is based in the Greater Toronto Area and works with cities and towns throughout Ontario such as from Burlington, Hamilton, Cambridge, Stoney Creek, Milton, Oakville, Brampton, Mississauga, Toronto, Markham, Scarborough, Pickering, Halton Hills, Caledon, Vaughan, Richmond Hill, Woodbridge, Etobicoke, North York, Concord, Maple, Barrie and many more.